This is three layer gold-veined, cold process soap created for the Bah-Humbug 6 swap that was made by Denise in PA. I’m using this bar in my shower right now and I love gold vein between the white and burgundy colors. Thanks for chiming in! =) I appreciate the tips. Denise here…finally getting a chance to reply. Thanks for all the wonderful comments. And, thank you, Anne-Marie for commenting for me with my own words! Very much appreciated! When I do layered cp, I make one layer, bringing it to trace. As soon as it’s scented, colored and poured into the mold I begin mixing the next layer. I treat each layer as a seperate batch, weighing the oils and mixing the lye solutions at the same time. As soon as one layer is poured into the mold and covered, I begin mixing the next layer. The first is set up enough to pour the next layer over it. You were in the swap too? Cool! What did you end up sending? I was in the swap too! This soap was awesome!! Not only was it beautiful, and smell wonderful, but it made my skin feel so soft…I love it! I’m still in awe that this is CP soap! It must be poured at a very light trace and allowed to harden a bit before pouring the next layer. And Heidi, I personally wait about 20 to 30 minutes but have waited up to 3 or 4 days before with the layers sticking together. Hopefully, a couple other CP’ers will post what their timeline is so you get a good variety of answers. Those layers are so precisely even….I’m envious! I’m curious… How long is too long to wait between making the layers? I’m planning a batch with 2 layers, one large and one small. 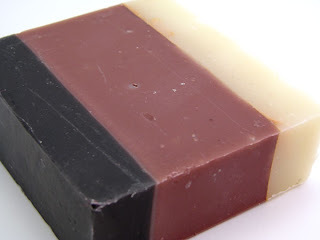 Since I have to plan my soaping time around kids being occupied I’m wondering if its ok to make one layer in the afternoon and the other in the evening? It is always fun to see others creative soaps. And especially when you “know” the soaper. We’re big fans of Denise’s (in PA) soaps from various swaps we’ve been in with her, including this very same swap and soap. Wow those layers certainly look perfect.